Have a client that isn’t afraid of a little color? What about A LOT of color? BTC Team Member and #ONESHOT Winner Julie Holbrook (@headrushdesigns) created this vibrant berry bob and we just had to share! Keep scrolling for Julie’s formulas and how-to steps! 1. Prelighten hair to a Level 9 or 10 using Formula A. 2. Shampoo using Matrix Keep Me Vivid Shampoo. While still at the sink, apply Formula B to the roots and let process for five minutes. Then, apply Formula B to the rest of the hair and allow to process for another five minutes. Shampoo only and towel dry the hair. Pro Tip: When applying Formula B start in the back to keep the hairline the lightest in the color process. 3. While the hair is still slightly wet, create a deep zigzag parting around the entire head. The depth of the parting will be determined by how much visible color is desired. 4. Apply Formula C to the hair below the zigzag parting making sure to fully saturate. Let color process for 15 minutes and then rinse with cold water. Condition only using Matrix Keep Me Vivid Conditioner. 5. 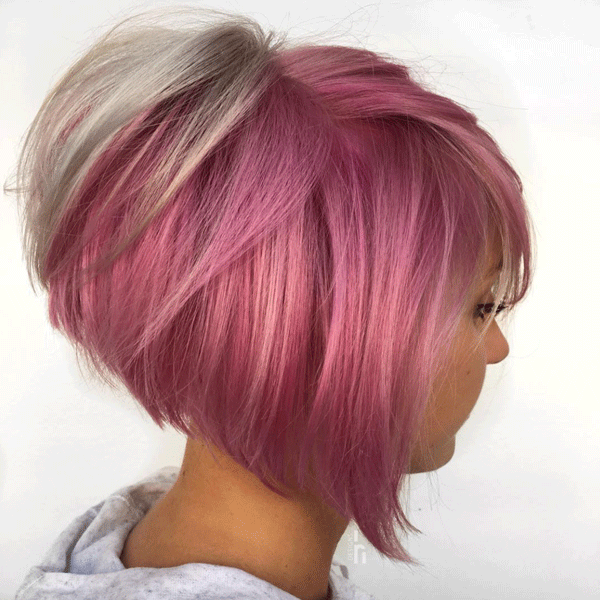 Click through to see more of this gorgeous color!